One of the first things many food truck business owners need to find is a commissary or commercial kitchen. Many states and municipalities require food trucks to work out of a licensed commercial commissary. A commissary could be a licensed commercial kitchen, restaurant, shared-use kitchen or any foodservice operation that is licensed and inspected by the local health department or a state agency like the department of health or agriculture. In addition, there are cities where cooking is not allowed on the truck, the cooking and packaging of the food must also take place at the commissary. 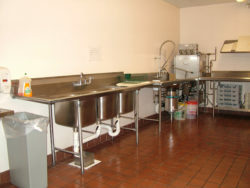 Usually, to meet the minimum standards required by most state and municipal health departments, a commissary needs a three-compartment sink, a handwashing sink, dry and cold storage, and have a foodservice operation license. 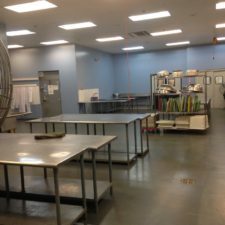 A full-service commissary will include all the previous amenities, plus have additional services that include but are not limited to fresh-water fill-up, wastewater disposal station, electric hookup for overnight truck parking, propane filling station, food preparation tables, food processing sink and bagged ice. Some commissaries also supply food, beverages and other supplies that food trucks can purchase on a daily basis. There are even special commissaries that assist with event and location placement, marketing and advertising, as well as business support services. For most new food truck owners, a shared commercial kitchen is the most viable option. A shared-use kitchen is leased out to multiple caterers or chefs at once. It is a group kitchen for foodservice professionals. Because you share the lease with other businesses, you will save a lot of money like this, but if you and a co-renter want to schedule the space at the same time, you can have problems. Leasing out your own private commercial kitchen space is the best option for a food truck business with large-scale aspirations. The benefits to having your own kitchen are endless. 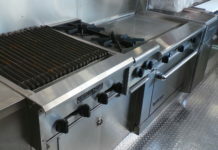 You do not have to worry about kitchen availability, and you can purchase or lease your own equipment to ensure that you have everything you need to execute your menu on a large scale. Finding the right commissary is an integral part of a successful mobile food business. The most important aspects of a commissary are location and type of services provided. Contact the local health department for the regulations and requirements governing licensed commissaries in the community. A full-service commissary will help enhance the economic viability of the food business while addressing the challenges of providing safe, delicious food to your customers. 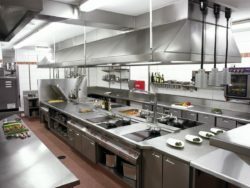 Once you know what kind of kitchen you want, you can start shopping around to find the best pricing and amenities for your commercial kitchen. One great tip to follow is to speak with other local food truck operators to find out which commissary or commercial kitchen they use. Some may, or may not suggest using their current kitchen, but at least you can find out the current rates in your area. Your local health department can provide you with a list of the registered commercial kitchens in your area as well, some municipalities have even started providing these lists from their websites.